Kaho Maeda, Dr. Hideto Ito, Professor Kenichiro Itami of the JST-ERATO Itami Molecular Nanocarbon Project and the Institute of Transformative Bio-Molecules (ITbM) of Nagoya University, and their colleagues have reported in the Journal of the American Chemical Society, on the development of a new and simple strategy, "helix-to-tube" to synthesize covalent organic nanotubes. Organic nanotubes (ONTs) are organic molecules with tubular nanostructures. Nanostructures are structures that range between 1 nm and 100 nm, and ONTs have a nanometer-sized cavity. Various applications of ONTs have been reported, including molecular recognition materials, transmembrane ion channel/sensors, electro-conductive materials, and organic photovoltaics. Most ONTs are constructed by a self-assembly process based on weak non-covalent interactions such as hydrogen bonding, hydrophobic interactions and π-π interactions between aromatic rings. Due to these relatively weak interactions, most non-covalent ONTs possess a relatively fragile structure. Covalent ONTs, whose tubular skeletons are cross-linked by covalent bonding (a bond made by sharing of electrons between atoms) could be synthesized from non-covalent ONTs. While covalent ONTs show higher stability and mechanical strength than non-covalent ONTs, the general synthetic strategy for covalent ONTs was yet to be established. A team led by Hideto Ito and Kenichiro Itami has succeeded in developing a simple and effective method for the synthesis of robust covalent ONTs (tube) by an operationally simple light irradiation of a readily accessible helical polymer (helix). This so-called "helix-to-tube" strategy is based on the following steps: 1) polymerization of a small molecule (monomer) to make a helical polymer followed by, 2) light-induced cross-linking at longitudinally repeating pitches across the whole helix to form covalent nanotubes. With their strategy, the team designed and synthesized diacetylene-based helical polymers (acetylenes are molecules that contain carbon-carbon triple bonds), poly(m-phenylene diethynylene)s (poly-PDEs), which has chiral amide side chains that are able to induce a helical folding through hydrogen-bonding interactions. The researchers revealed that light-induced cross-linking at longitudinally aligned 1,3-butadiyne moieties (a group of molecules that contain four carbons with triple bonds at the first and third carbons) could generate the desired covalent ONT. "This is the first time in the world to show that the photochemical polymerization reaction of diynes is applicable to the cross-linking reaction of a helical polymer," says Maeda, a graduate student who mainly conducted the experiments. The "helix-to-tube" method is expected to be able to generate a range of ONT-based materials by simply changing the arene (aromatic ring) unit in the monomer. "One of the most difficult parts of this research was how to obtain scientific evidence on the structures of poly-PDEs and covalent ONTs," says Ito, one of the leaders of this study. "We had little experience with the analysis of polymers and macromolecules such as ONTs. Fortunately, thanks to the support of our collaborators in Nagoya University, who are specialists in these particular research fields, we finally succeeded in characterizing these macromolecules by various techniques including spectroscopy, X-ray diffraction, and microscopy." 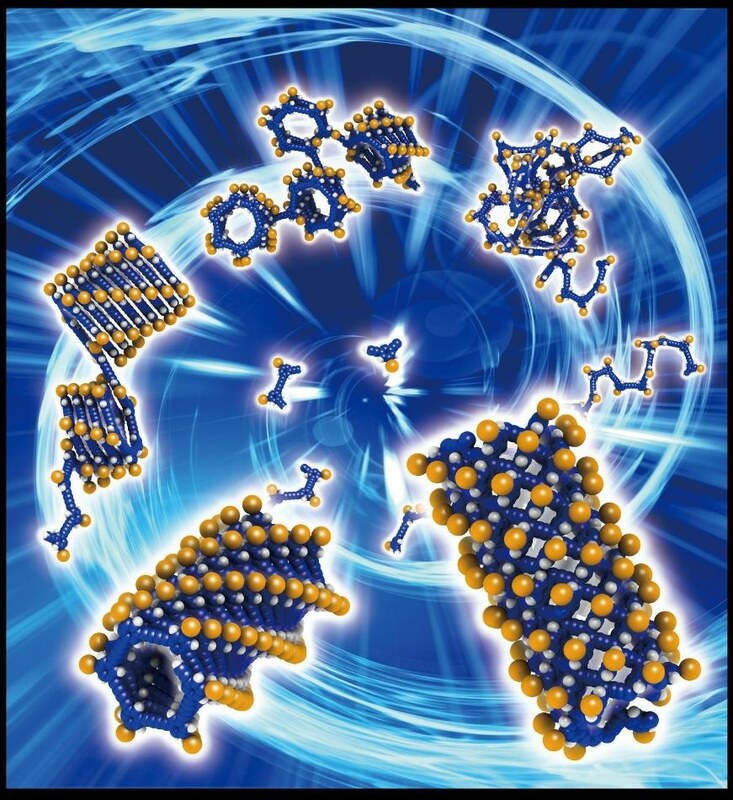 "Although it took us about a year to synthesize the covalent ONT, it took another one and a half year to determine the structure of the nanotube," says Maeda. "I was extremely excited when I first saw the transmission electron microscopy (TEM) images, which indicated that we had actually made the covalent ONT that we were expecting," she continues. "The best part of the research for me was finding that the photochemical cross-linking had taken place on the helix for the first time," says Maeda. "In addition, photochemical cross-linking is known to usually occur in the solid phase, but we were able to show that the reaction takes place in the solution phase as well. As the reactions have never been carried out before, I was dubious at first, but it was a wonderful feeling to succeed in making the reaction work for the first time in the world. I can say for sure that this was a moment where I really found research interesting." "We were really excited to develop this simple yet powerful method to achieve the synthesis of covalent ONTs," says Itami, the director of the JST-ERATO project and the center director of ITbM. "The "helix-to-tube" method enables molecular level design and will lead to the synthesis of various covalent ONTs with fixed diameters and tube lengths with desirable functionalities." "We envisage that ongoing advances in the "helix-to-tube" method may lead to the development of various ONT-based materials including electro-conductive materials and luminescent materials," says Ito. "We are currently carrying out work on the "helix-to-tube" methodology and we hope to synthesize covalent ONTs with interesting properties for various applications."